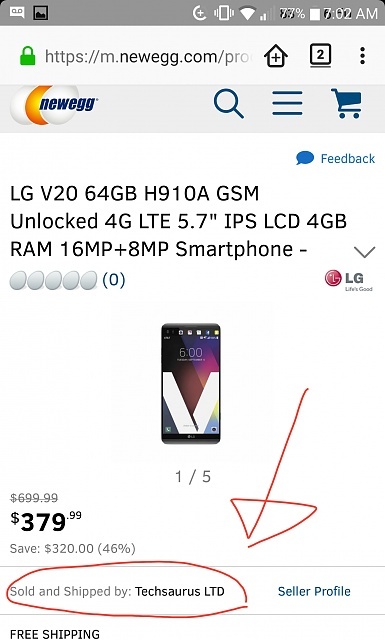 GPS issues: LG refuses warranty because phone was bought new "unlocked"! Bought the V20 new, from newegg, two months ago. Now GPS is functioning horrible...constanly losing signal. Newegg advertises phone as Unlocked New H910 (ATT). LG says they show IMEI as 2016 activation! And they will not honor any warranty on "Unlocked" phones. They say "unlocked" voids warranty. Has anyone run into this? I would reach out to Newegg if it were me. I guess whomever you talked to at LG thought the phone had been unlawfully unlocked (by patching, etc. if this were the case, YES, per their Warranty terms, this would, indeed, void the warranty). If you purchased the device as new and LG claims the IMEI had been active before, I'd reach out to Newegg to get clarification on this. It IS weird that the model would be ATT and it's being sold as unlocked (factory unlocked phones do have a different model number). Ry and Rukbat like this. I also got an unlocked phone from eBay. The first thing I did was register it with LG and everything went fine. They didn't say a word about it being registered before but I'm not sure that they would have. I said I bought a new and it was never an issue. I'm having another issue with Wi-Fi but I'll put that in a another post. They say it's manufacturer's responsibility. Product is sold thru their website but they use shady third-party vendors. They sent me over to the third party vendor for customer service. Awful. I have to wait two days for these guys to respond to me. It's totally weird. I had trusted both LG and Newegg but now I don't trust either. I made perfectly clear to LG that this happens all the time, phones are often sold Unlocked. this means that they are manufactured by LG as an ATT-branded phone but they are not locked to ATT and they can be used on any GSM carrier. That's the Unlocked part. This was brand new in shrink wrap, not a refurb. LG knew what unlocked meant, but they still said, ANYTHING sold as UNLOCKED will be considered voiding the warranty. I said "I think hyou are referring to "rooted". But LG said, no...unlocked. We will not warranty. I said "LG sells phones Factory Unloced, direct. Do you not warranty those? So here is Newegg, on their website, New, Unlocked H910...specifically states With USA warranty. but they claim that they have never heard of this issue before. WTF? I had a G3 that developed major wifi issue; just died. Would not work. Very frustrating. I think I am done with LG. LG doesn't shrink wrap their phones. Are you sure it was shrink wrapped, or did it have the stick on protective film on each side? If it was indeed shrink wrapped, then that tells me it was being sold by a third party that may not be a factory authorized dealer. Even the factory refurbished phones come with only the protective film (which I now know thanks to a recent warranty exchange myself). Being shrink wrapped also makes it highly suspect that it is used and possibly tampered with. Since LG shows an initial activation date in 2016, I'm currently leaning towards this not being a truly new phone. So where does that leave you? I think this needs to be taken up with Newegg, as they sold it "as new." I've never bought from them, but that you said they told you to contact some other vender makes me think it's similar to Amazon and their third party venders. In which case, this could be some fly by night operation and your chances of a good outcome may be slim. But i can only go by what you have said so far, which hinges on whether or not the phone was really shrink wrapped. It IS weird that the model would be ATT and it's being sold as unlocked (factory unlocked phones do have a different model number). I did find this thread where AT&T confirms that there is an H910 and H910A. The H910A is a factory network unlocked phone. The package was shrinkwrapped. The phone itself came with all the appropriate protective peel-off films on screen and bezel. I have the unlocked H910A. LG will not warranty it. Thanks for the clarification. The fact that this phone was apparently already activated still indicates that this was a used phone. I'm thinking LG is correct in denying the warranty, and your claims lie with Newegg and their vendor. Perhaps you could file a complaint with the Better Business Bureau, but I'm not sure how successful that would be. Ry, B0WIE and SpookDroid like this. ^This sounds correct. A new V20, carrier issued but unlocked, and in shrink wrap? That sounds like an ambitious 3rd party trying to maximize their profits. I wouldn't be mad at LG here. It sounds like Newegg, who is now using 3rd party vendors like Amazon, needs to be made aware that they are doing business with a dishonest vendor. Amazon goes through this too. Take it up with Newegg and if they are unresponsive, contact your credit card company and see if they will help you as it's a fraudulent sale (repackaged, used merchandise sold as new). The 3rd party seller can claim that it's new according to them, but in reality, nobody knows where it came from. Just like buying a used car, it has an unknown history from a possibly dishonest seller. Be careful, lots of fake Chinese clone phones out there... and 3rd party selling "new" phones that aren't actually new. The LG phone boxes do not come shrink wrapped but has a seal tape. Very likely the phone was "refurbished", seller probably had a deal on used V20 phones and repackaged them, claiming they are new. There's a lot of this on eBay.. "New - Other" condition is not new. The V20 is discontinued and finding it new is difficult and can be sketchy.. plus lots of fake clones out there and "refurbished" ones. This business of a company having shady third party vendors that they cannot take any responsibility for is baloney. I happened to me with walmart a few months ago trying to buy this very phone. Never will I buy from walmart online again. That is just very poor practice. Sure, they can sub out anything they want, but they are responsible for the overall transaction and customer satisfaction. Not just shrug shoulders and dump you to Shady Eddy's. ATT ota updates. Is this true? To you have to be rooted and flash a stock ROM to achieve this? Read a few posts above. There is an official ATT unlocked variant that the OP does have. Here it is two days later and the shady third-party seller still has not got back to me. Now I have to go back to newegg and harass them. To top it off, this morning, my glass screen protector had a crack so I peeled it off. It was stuck surprisingly tightly to the screen. At the bottom, it was super tight...and I cracked the real screen pulling off the screen protector. How ironic. Now the whole idea of returning it is probably off the table. I'm so pissed. My brand new phone has non-functional GPS. I've also noticed that regardless of where I am in the city, I NEVER have above three bars of signal. (where other people on ATT have five) So to me this seems like an antenna issue on both GPS and cell radio. Well maybe next phone it's time to visit Mr Samsung. Maybe next time you should avoid shady third party dealers and buy from a factory authorized dealer. That's where your problem is, not LG. hallux and dellaster like this. Well that's not possible because thr V20 is not currently in production so all thats available is odd lots, refurbished, NOS, etc, and not thru usual sources such as B&H, Bestbuy, etc. Fair point, and that should've been the clue to you, as this seller was claiming an out of production device as new. so, is there any way to find out who has owned your phone by using the IMEI address? I got my phone from a guy on eBay, my phone was sold as brand new and it look brand new and I really think it is the only problem I have is sometimes the Wi-Fi signal really slows down. I don't know if that is the phone or my Wi-Fi. when I reboot it's backed to 180 megabits per second but it drops down to at times 30 to 40 megabits per second. someone suggested it's the Wi-Fi transmitter but I have a feeling something about that reboot reset the phone somehow in it fixes the slowed Wi-Fi. there are times when I'm finding it picks up my neighbors Wi-Fi that I have in my phone. and that goes through an actual cement firewall. so I'm wondering if there's something about the v20 that slows Wi-Fi. by the way I am on modem number three. Comcast is here and they replaced it my original modem which was actually a replacement of a prior modem when I had my Note 4 and now I returned the new modem to Comcast and bought a surfboard Arris modem from Amazon. It's acting the same way so hopefully I get my money's worth. I think I need 18 months to break even. so it could be the Comcast signal but why then does rebooting always fix it and often times changing the server back and forth fixes it. The XDA forums are great for learning how to hack and modify your phone. I have flashed a soft bricked phone before, it's possible... it just depends on the manufacturer if they allow it. You just need the ROM and instructions to flash it and a computer. I would send an email to the 3rd party seller and threaten to sue them.. they might just respond and give you a refund.. you can probably file a complaint and get their business license investigated.. If they have a Facebook page, I would also spam them and warn others.. Keep calling their business phone number..
OR if you bought it with a credit card, your credit card may provide insurance for it.. it depends on your credit card. I know American Express does.. you can have the charge reversed and the credit card will give you back your money.. just file it as fraud. After the new update contact image no longer loadable? Why does my LG Aristo phone home screen keep on crashing? My lg g4 phone is tuning on but is not show any of my apps on my screen. How can I fix it?